For science fiction fans, brain control might sound like something out of your favourite movie or novel—but thanks to EEG headset and apps, brain control has quickly become science fact! EEG headsets give you the ability to control games and apps using only your mind, unlocking an entire exciting world of possibilities. This post will give you an insider’s look into the best apps and games so you can try out brain control with an EEG headset for yourself! NeuroSky’s MindWave Mobile EEG headset is what makes apps and games that use brain control possible. These headsets safely harness the power of your mind to explore your brainwaves and see just what exciting things you can do! The MindWave and the MindWave Mobile headset are both available in the NeuroSky Store. Brain Control Apps for Everyone! Entertainment – Of course you’re going to want to use brain control for fun and, and honestly, there’s no better way than with Throw Trucks With Your Mind.Designed to give you telekinetic super-powers, Throw Trucks With Your Mind uses your thoughts to defeat your enemies in superhero showdowns for the ages! Throw Trucks With Your Mind offers training, online multiplayer modes, and multiple levels to test your skills, making it a blast for gamers of all ages. Throw Trucks With Your Mind is available in the NeuroSky App Store. Attention/Brain Fitness – NeuroSky’s MindWave headset allows you to train your brain, building your ability to focus and concentrate on the task at hand. Of course, having an app that turns this into a captivating task makes training your brain all the more enjoyable. Attention Control: ZenZone does just that. By using guided mindfulness techniques, the ZenZone app will help you meet and surpass focus and concentration goals. The ZenZone provides you with real time measurements of your state of mind, as well as instant visual feedback, so you can track your results and monitor your brain fitness levels as you progress in your training. Attention Control: ZenZone is available in the NeuroSky App Store. Relaxation – After training your brain, you’re going to want to relax. Brain-Starter gives you the power to do just that. Through the use of cognitive exercises, Brain-Starter can improve your ability to relax, focus, and concentrate. Brain-Starter even has the ability to use movies and music from your iTunes collection to support you in your training, keeping you feeling refreshed, relaxed, and ready for the task at hand. Brain-Starter is available in the NeuroSky App Store. With an EEG headset from NeuroSky you’ll unlock power you never knew you had. Whether you’re interested in games, improving your overall mental fitness levels, enhancing your learning experiences, or more, we have you covered! 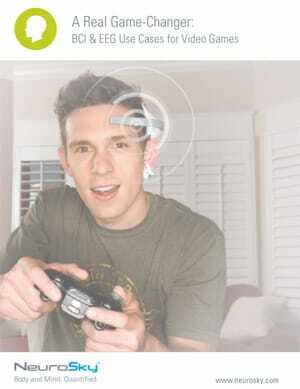 Shop for brain control headsets and apps in our store.